Premium Italian saddle maker Fizik (pronounced “physique”) introduces a line of Cyrano drop handlebars and stems for 2014. The Cyrano bars (in several price levels of alloy and carbon) follow the company’s “Spine Concept” first applied to their saddles. The concept is based of the theory that the flexibility of your spine determines your optimum saddle shape. If your back is rather flexible, you would ride the Arione saddle; Fizik nicknames you a “snake”. If you’re not flexible, you’re a “bull”, and you take the Aliante saddle. In between the two would be a “chameleon” on the Antares saddle. 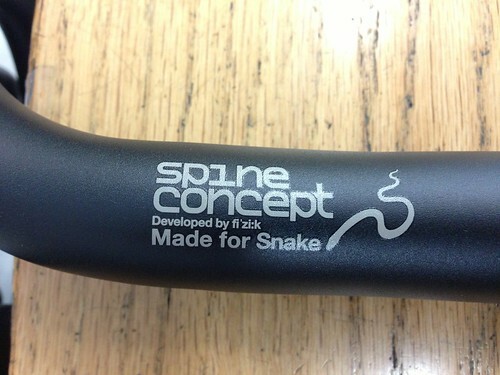 Fizik extends this idea to their new handlebars. I’ll be honest; I’m not sure I buy into this Spine Concept. I’m even less sure that the concept is valid when applied to a rider’s combined preferences for handlebar and saddle. What if I prefer a “snake” saddle and a “bull” handlebar? Am I not allowed to do that? An Arione saddle was designed long before Fizik started bandying about this fancy concept. Riders like Gilberto Simoni on Cannondale-Saeco and other Italian stage racers were consulted, and what Fizik ended up with was a saddle as long as the UCI would allow, with a extended tail that riders sit back on to get fuller extension of the legs while climbing long grades. The Arione’s long, flat profile allows riders to use the whole length of the saddle. I wouldn’t consider myself to be all that flexible, yet I love the Arione. It’s like my taint found its soulmate. But should my taint to choose my handlebar? Still, handlebars have existed without taint theories, so maybe we should just consider the handlebars based on their shapes. Like the saddles, there three bar types: Bull, Chameleon, and Snake. All three of the bars use the modern 31.8mm clamp standard. The Bull has a reach of 80mm and a 130mm drop. By those numbers and general form, the Bull could be described as a compact bend. The shape of the Bull is almost exactly in between the 3T Ergosum and FSA’s “Wing Pro Compact”. It has the tight radius transition from the ramp to the hook like the 3T, but a more curved hook with 3deg flare at the drop like the FSA (4deg). The Bull’s reach is within 5mm of the average compact bend, while the 3T’s 89mm is one of the longest of the lot. A less common trait that all Fizik bars share with Pro’s Vibe series of handlebar is that the bar maintains the 31.8mm diameter almost all the way across the tops of the bar, but the Fizik bars have the typical square shoulder of most modern bars rather the almost track bar shape of the Pro Vibe series. By keeping the diameter big up top, handlebar stiffness is improved. The angle of the ramps is about the same as the typical compact bend and much less than bars like the venerable Cinelli Giro d’Italia. Bars like the Bull work best with the current generation of integrated brake/shift levers which are designed to be clamped high on the hook and create a continuous, flat transition from the ramp to the lever body. The Bull’s tight bend from the ramp to the hook means that the angle of the body changes rapidly depending on how far up or down you position the lever. In my experience, bars like this work better with SRAM or Shimano than Campagnolo levers because the first two have built-in reach adjustment. Thus you can independently align the lever body with the ramp and then use the lever’s reach adjustment to pull the lever blade in to make it accessible from the hook. Over the years many handlebar brands have marketed bars for smaller riders with “ergo” and “compact” bar shapes that have a short drop and tight bend at the top of the hook. The irony is that bars like this, including Fizik’s Bull, are easier to grab onto the hook, but without the reach adjustment in the lever, braking from the drops is almost impossible if you have small hands (as smaller riders oft have). Of course, riders typically use the lever hood as the primary hand position (with levers evolving in parallel), but it seems ridiculous to buy a bar that is easier to ride in the drops and then not ride in the drops because you can’t use the controls from there. The old Ritchey Biologic bars were horrible in this respect. Fizik says that “Bull” riders are often larger athletes with big hands, so the the curve was designed without tight bends that would cramp larger hands. However as a bike fitter, I know that this “Bull” bar is going to be chosen by many riders who are neither large nor endowed with big hands. The Bull’s opposite is the Snake. More than the other Fiziks, the Snake looks a lot like a traditional road bar. With 85mm of reach and 140mm of drop, the Snake is perhaps best compared to the Deda “Deep” shape, still available on the Newton handlebar, except that the Snake has 3deg of lateral flare and a sharper transition ramp-to-hook for modern levers. Sometimes called a “Belgian bend”, the shape of the Snake requires the rider to reach pretty far down and out to grab hold of the hooks. Actually, the Spine Concept makes a lot of sense when you’re talking about the Snake handlebar, because a rider without a fair bit of flexibility isn’t going to be able to use this bar effectively. If the Bull was designed for large power full riders, supposedly the Chameleon was designed for limber riders. If you are thinking about switching from one of the more typical compact bend bars on the market to the Cyrano Snake, I’d recommend fitting a 10mm shorter stem. The Chameleon (reach 85mm, drop 135mm, flare 3deg) is supposed to be right in between the other two Fizik bars. All of these bars are designed so that the grip portion down behind the hook will level or slightly up (ie, the ends of the bar pointing slightly down towards the rear axle), and when so positioned the angle of the hook is somewhat similar to the “ergo” or anatomic” bends that came out during the 1990s. 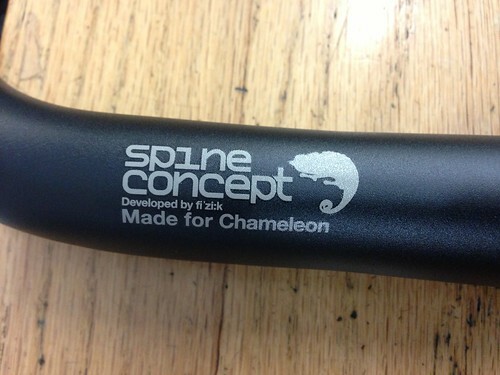 However, the Chameleon lacks the abrupt bends of those bars, instead blending smoothly much as the typical compact bend. In my mind I see the Chameleon and Bull as two different flavours of the modern compact bend and the Snake as something of a throwback. I’m not saying that the Snake is a bad design, but I think it will be harder to market. The average road bike consumer understands the compact bend; it allows him to run his bars really low “like all the pros”, but he does in fact realize he can’t ride in the drops as easily. But there are a few pros and all importantly a few consumers who have been waiting for a bar like this. With these three handlebar shapes, Fizik has taken an intelligent approach to giving riders clearly defined choices. An example of how not to market handlebars would be Zipp. As SRAM’s in-house brand for road stems, bars, and seatposts, Zipp clearly has design and marketing resources, but their model designations just confuse consumers rather than delineate the how the product lines interrelate. What’s worse is that they keep changing the shape and names of their bars so that there’s no continuity from year to year. Whether or not you believe in Fizik’s Spine Concept, you can easily remember what each of the bars is like. Looking at both the dimensions and the subtleties of shape, I like the Cyrano range of handlebars, regardless of my distrust of marketing concepts. The physical form of all three versions of the Cyrano are refined and devoid of quirky gimmicks. I have not had a chance to ride any of these bars yet, but I have experience riding similar. I personally seem to gravitate towards either a Bull shape or the Snake depending on the bike. On my cyclocross bike I use more of a Belgian shape (though with less reach than Fizik’s Snake) because the bars are higher than my road bikes; thus I reach further down and forward relative to the top of the bar. On my road bikes I run the bars rather low, so I like the drops shallower and slightly more horizontal for my wrists when I move out of the saddle while sprinting. If you are still searching for the handlebar that works for you, I’d recommend taking a look at Fizik’s offerings.